When was the last time you took the time to sit and evaluate your business? 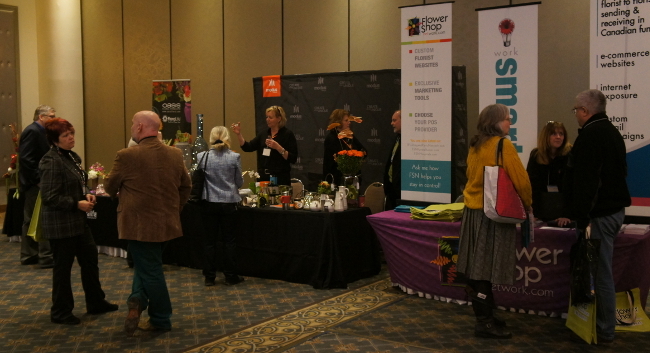 That’s exactly what we did at the 2015 Canadian Florist Business Forum and it was a great day of networking and great business presentations shown in attention grabbing ways. 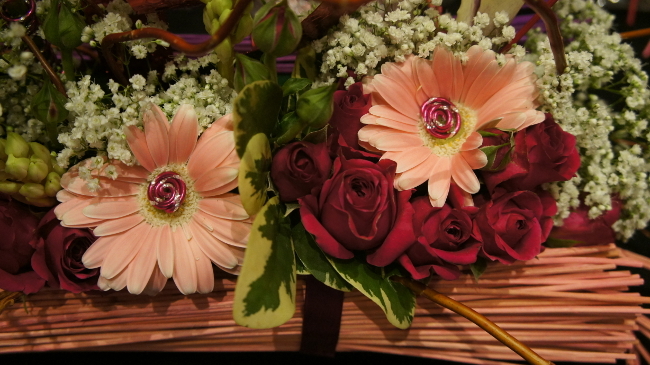 Most floral business owners usually sigh and avoid business presentations since they instantly think it’s going to be boring and way to unexciting but the Canadian Florist Magazine does a great job providing speakers that can take business programs and have a little fun with it or present it in a way that gets you excited to try their suggestions in your own business. This year had Star Wars and flying oranges all while having amazing business building information being presented. 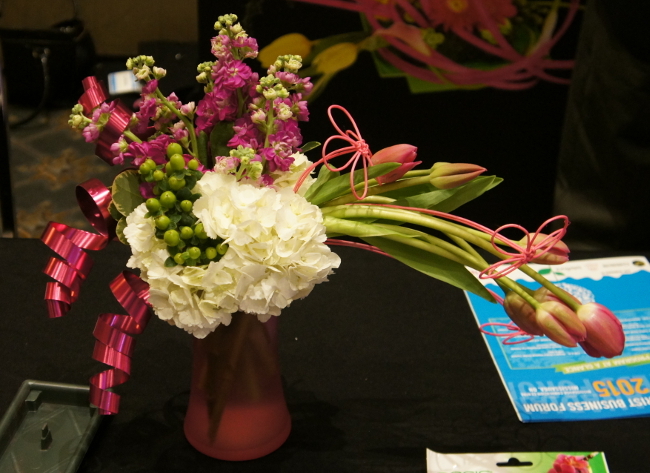 So we hope you enjoy some tidbits from our fun floral adventure to Mississauga, ON for the 2015 Canadian Florist Business Forum! 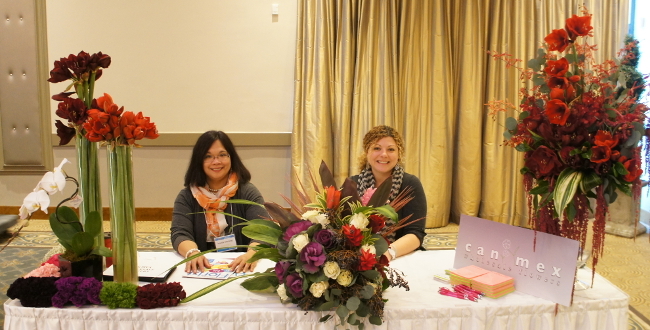 The girls of can mex wholesale flowers showcasing some of their amazing products. 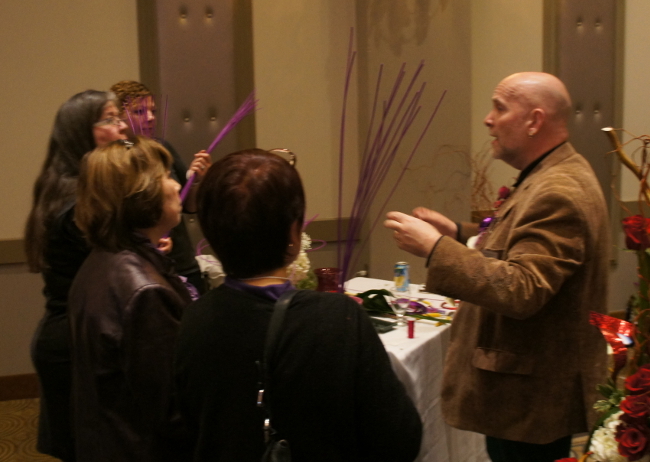 Attendees during a networking break between speakers. 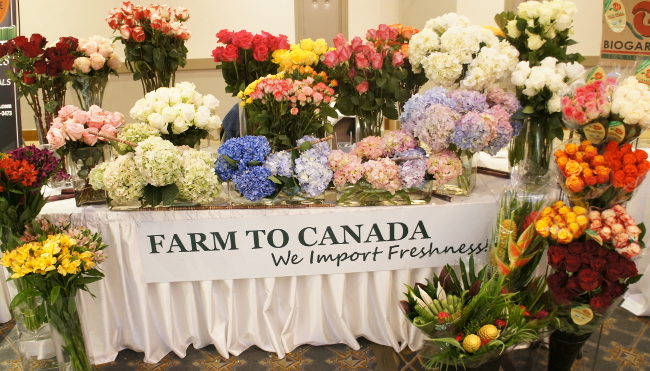 Farm To Canada wasn’t just showing off their amazing hydrangeas and organic roses but also giving away a box of these amazing hydrangeas to one lucky attendee! 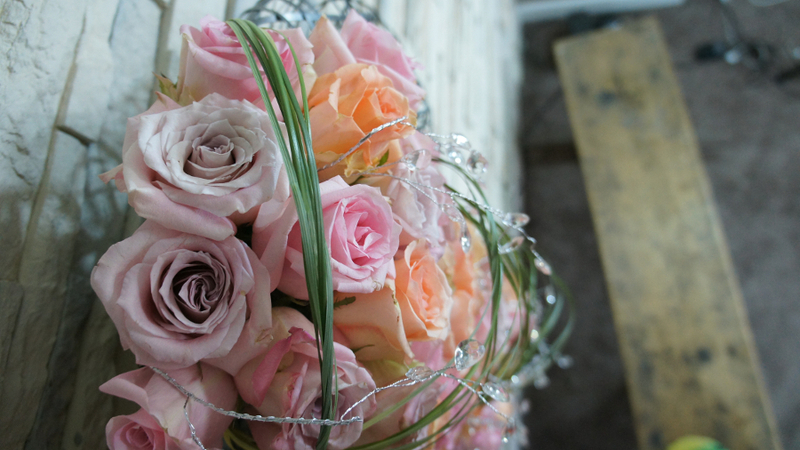 Next to the organic roses we were living for the amazing mixed tropical bouquets, especially the tropical bouquet with miniature bananas. 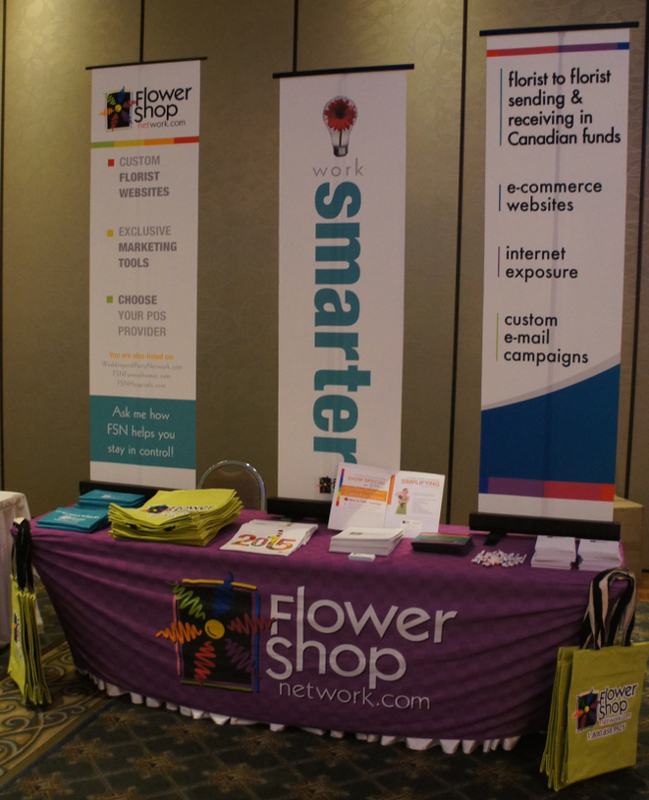 Flowershop Network’s Booth before the show started. Smithers-Oasis reps relaxing before the doors opened. Neville MacKay designed for Smithers-Oasis throughout the breaks and lunch to showcase different Smithers-Oasis products with interesting ways to use or manipulate them. 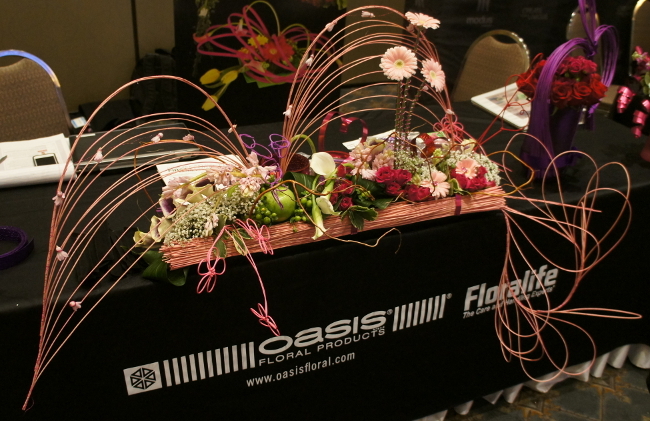 One of Neville MacKay’s networking break designs showcasing the Smithers-Oasis Pink OASIS™ Midollino Flower and the Strong Pink 1/2″ OASIS™ Flat Wire. 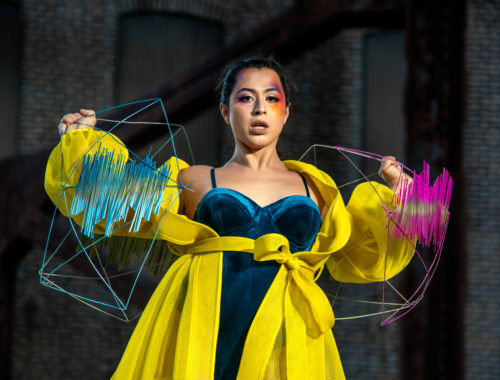 Neville MacKay created this piece showcasing the easy manipulation of the Smithers-Oasis Pink OASIS™ Midollino Sticks with the added on visual affect of the Pink OASIS™ Midollino Flower, Strong Pink 1/2″ OASIS™ Flat Wire binding and hearts, Strong Pink OASIS™ Diamond Wire detailing and the Purple OASIS™ Midollino Stick knots. 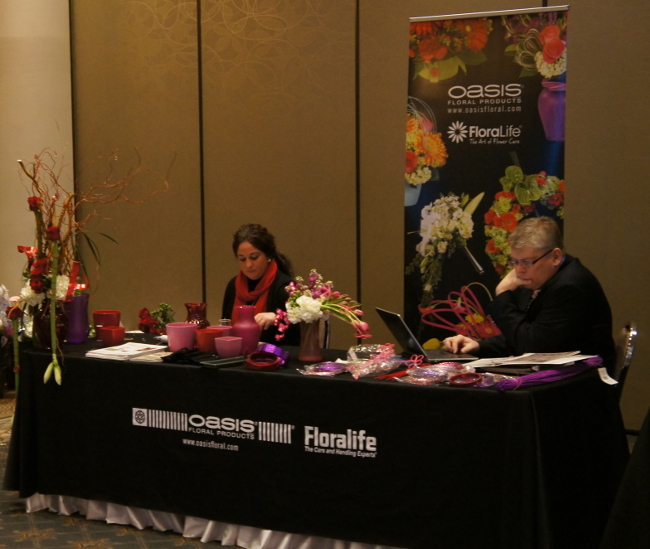 Neville MacKay took the time to discuss all the Smithers-Oasis products and hand out a few sample for attendees to get familiar with. 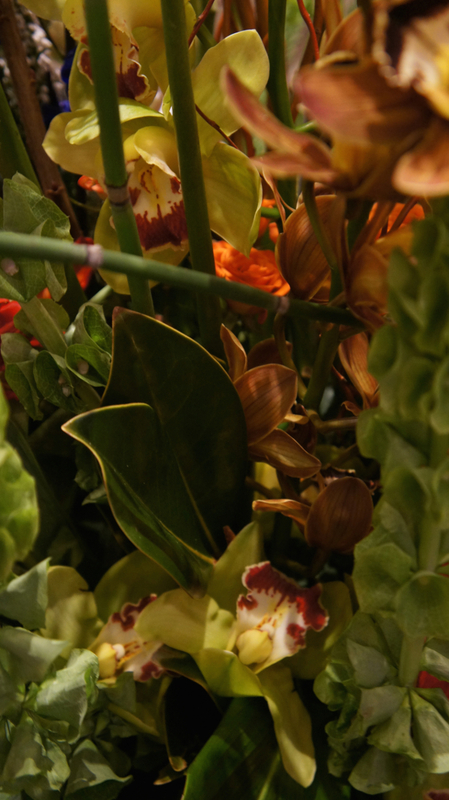 One of the amazing pieces from the Staallduinen Floral booth showing off dutch flowers. 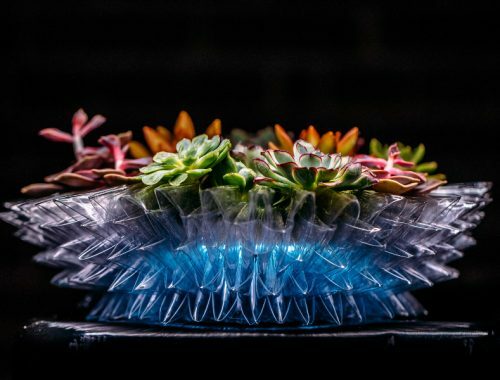 We enjoyed the depth and texture throughout the whole design. 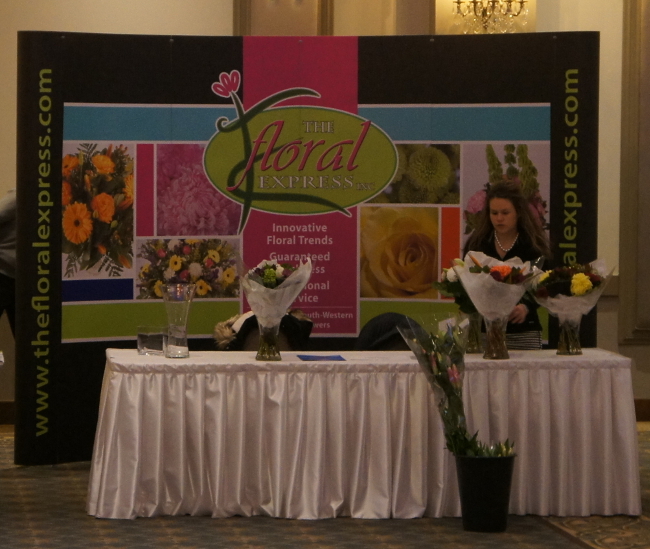 The Floral Express setting up their booth with some great mixed bouquets. 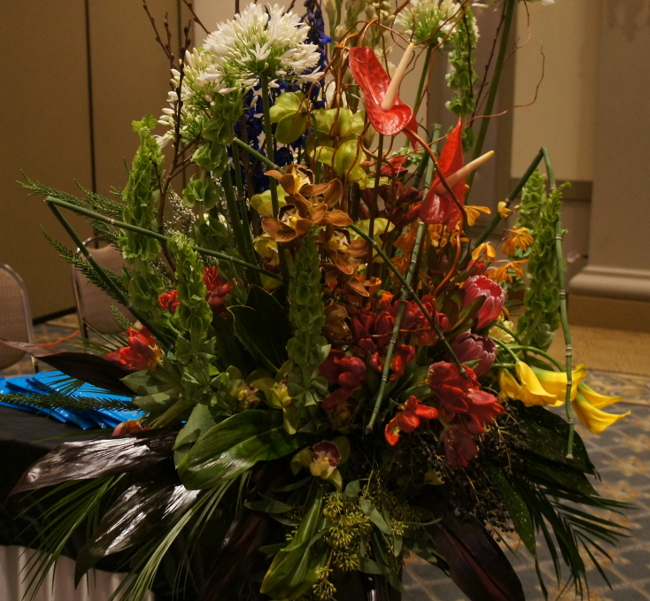 Floral.today had a great time at this years Canadian Florist Business Forum and truly enjoyed doing our presentation on “SOCIAL MEDIA FOR THE BUSY FLOWER SHOP”. We took away a better understand about search engine marketing from Ryan Freeman of Strider Search Marketing and Florist 2.0‘s fun Star Wars themed presentation, know more about risk management in the work place from the informative talk by Pete Karageorgos from the Insurance Bureau of Canada and got a way better understanding of plant care and maintenance all while catching oranges if you answered a question correctly (Mr. Daum is from Florida) with Steven Daum of Floralife and Superflor Technologies. 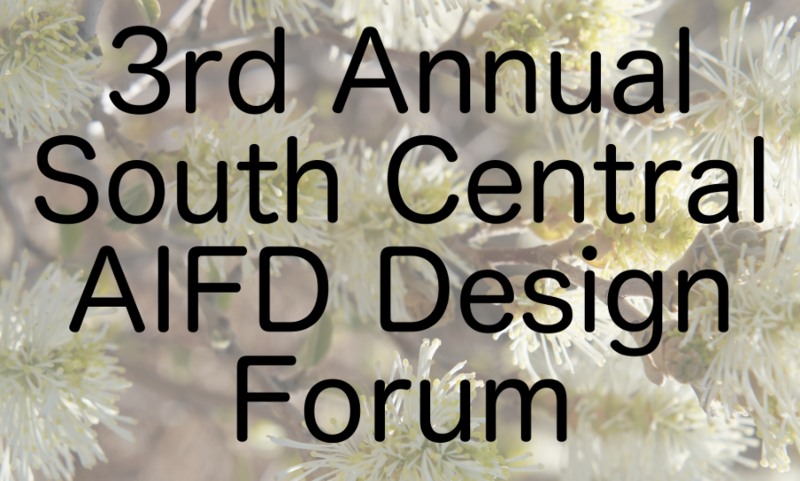 Once we have it done for the website we will post our presentation from the forum so watch for it and make sure to plan to be at this fantastic and though provoking event that is the Canadian Florist Business Forum. 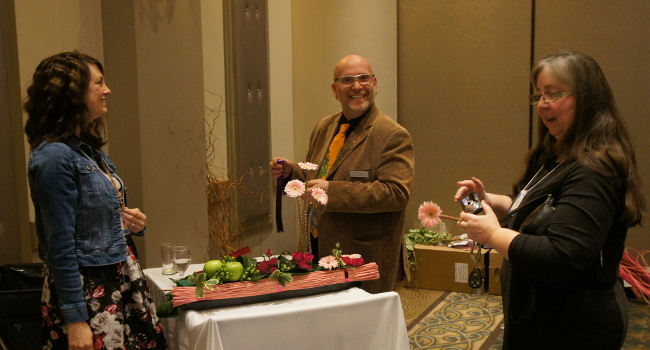 Thank you to the Canadian Florist Magazine and their staff for including Floral.today’s Garrett as one of their speakers for this awesome event. 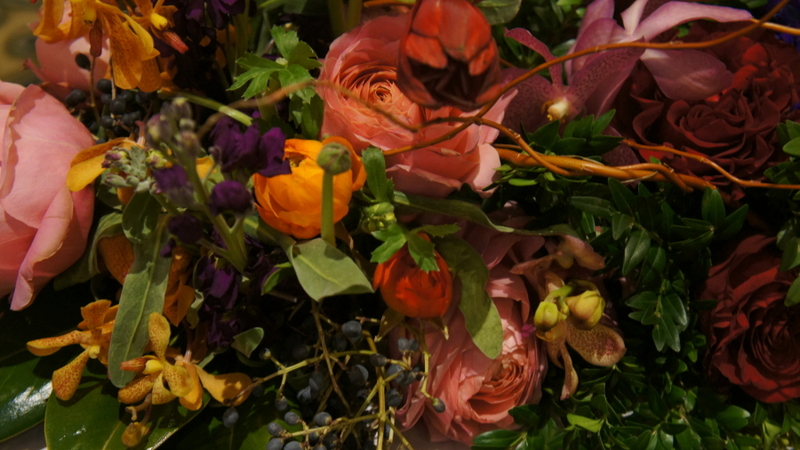 Also a huge thank you to Floral.today follower Rita Quayle of Flower Workshop for taking me on a floral adventure to the flower auction, her wonderful wholesaler and her shop. 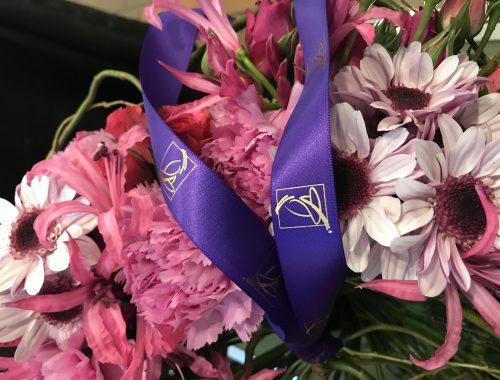 A super thank you also to Rita and her staff for creating me flowers to wear for my presentation as we are flower people and should take every opportunity to wear them when we can. 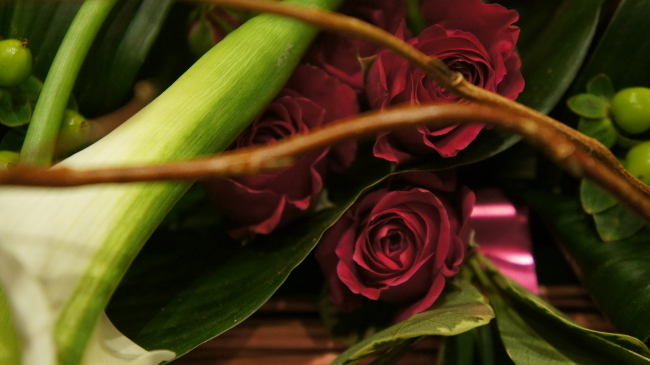 My last thank you is to Joseph Delarge for showing us the beautiful city of Toronto and his amazing shop Eco|Stems. 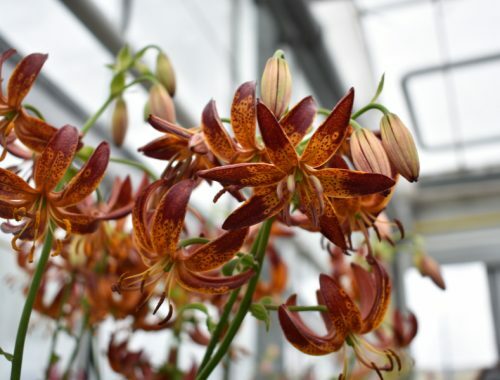 Check the Floral.today Facebook for all the photos from our adventures!